Bristol Finish users. Below are excerpts from an article in the 2015 April/May (#154) issue of Professional Boat Builder Magazine. The article refers to the use of traditional varnish, these portions have been edited since they do not apply to the use of Bristol Finish. However, the commentary and practices recommended by the author (particularly environmental conditions and prep work) are very relevant and can be considered for Bristol Finish. We would like to thank Reuel B. Parker and Professional Boatbuilder Magazine for giving us permission to reprint portions of the article. 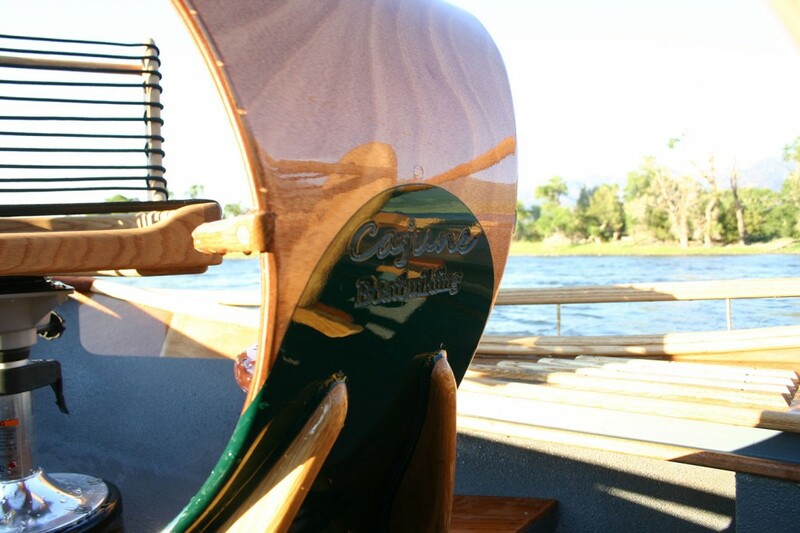 A custom boatbuilder approaches efficient varnishing a bit differently. Often the best brightwork is done by the talented amateur who has the time and the experience to do meticulous work—meticulous being the operative word. Some varnishers spend weeks on brightwork alone. But to survive in the competitive industry of professional boatbuilding, one must work rapidly and efficiently—and still produce top-quality work. For example, I built the prototype of my Commuter 36 (11m) design in 11 weeks, from lofting to launching, with three helpers (see “Out of the Everglades,” Professional BoatBuilder No. 130). This included making every brightwork-finished element by hand, including the mahogany table, all cabinet doors, drawers, and trim components, cypress ceiling planking, teak-and-holly cabin sole, and cabin/companionway doors. As a custom boatbuilder I have to make every minute and every dollar count, and that includes my approach to brightwork. Some of the techniques I describe here may seem to go against conventional methods, but I’ve found they work best for my commercial boatbuilding operation, and would be equally applicable to production and semi-custom boatbuilders. The goal is to get the material finished and installed as rapidly as possible without compromising quality. Time is not the only issue. Great varnish work is ideally done under sanitary conditions approaching those found in a hospital operating room—no dirt, dust, or air movement, immaculate containers and tools, clean clothing, cool temperatures, and low humidity. It is also important to avoid working in direct sunlight, as expanding air trapped in wood grain leaves bubbles. Unfortunately, while a lucky few may achieve something close to those conditions, those of us who work in the real world (i.e., a large, filthy boatyard in hot, humid, buggy, windy conditions) cannot come even close. Dirt is bright- work’s biggest enemy. Particulate matter, airborne seedpods, and kamikaze insects have been the norm in my various open-air boatshops in South Florida for more than 30 years. So I wait for times with minimum wind (often early morning); even the slightest breeze will find dust and blow it onto my wet varnish. I also look for no likelihood of rain, cool temperatures (also early morning), shade, and low humidity. If possible, I avoid the worst bug seasons. The faster my varnish can dry to tack-free, the better my chances of minimizing damage. After cleaning with compressed air, I wipe with manufactured tack rags to clear remaining dust from my surfaces prior to varnishing. As a professional, I cannot afford the luxury of applying one coat a day, sanding some of it off the next day, and applying another coat. For exterior brightwork, six coats are really the minimum number to achieve protection and durability; for interior varnish, three coats are the minimum. I try to apply two or three coats per day, lightly sanding them the following morning, applying two or three more coats, repeating the process, and applying a final finish coat under the most ideal conditions possible. If you apply multiple coats in unsanitary conditions without sanding, dust and dirt will inevitably be trapped in the layers. A light sanding will eliminate this problem unless large pieces of dirt, or insects, are trapped and necessitate a more thorough sanding, which removes more material than is desirable. Also, over one night three coats of varnish may not dry adequately for deep sanding, costing a day of lost time. I can save many days of labor by making all my trim at once. I then dry-fit and remove it, seal and varnish it all at the same time (or in large batches), and install it all at once. Whereas most boatbuilders install raw, unfinished wood trim and then sand and varnish it in place, I avoid that practice because of the extra time it takes, which includes masking-off. This means I cannot counterbore, screw, and bung my trim in place, but must glue it in place with epoxy and clamps, or glue and fasten it with a few pneumatically driven brads or, rarely, hand-driven stainless steel finishing nails. I fill the small fastener holes with epoxy tinted with red microballoons to match the color of most dark woods. I also glue corners and joints with the tinted epoxy. I wipe the puttied surface immediately with denatured alcohol to remove any residue. For deckbeams, coach roof beams, carlins, and other varnished structural components, I cut, dry-fit in place, and remove them. I then sand, seal, and varnish them prior to final installation, leaving glue-joint areas bare for adhesion. This allows components to be varnished upside down, by brush or spray gun, in large quantities, instead of working overhead inside the boat with varnish dripping onto my hair. In my opinion, exterior varnish should always be highgloss, for durability, with additives for ultraviolet (sunlight) protection. Surface Prep I tend to deviate from many professionals in prep work and sealers. I finish my preliminary sanding with #120-grit paper—no finer. I machine-sand first (where applicable) with a 5″ (127mm) hard pad on a Makita variable-speed orbital dual-axis sander. I then finish by hand, sanding with the grain, sometimes with a rubber or wooden block, and more commonly with a folded stick-on disc held between thumb and fingers; I never use hook & loop paper. I do not sand with finer paper prior to sealing, because I have found it unnecessary in almost all cases. After sanding, I remove dust with compressed air, followed by a tack rag made from cheese cloth with a sticky chemical. I seal all wood to be varnished, without exception, with two-part clear penetrating epoxy. I mostly use E-Bond Epoxy (106-C-2 and 106-C-3). On rare instances where I need a more viscous, deeper-penetrating epoxy, I reduce the catalyzed epoxy with epoxy thinner (50% methylethyl- ketone and 50% toluol or toluene). For a pre-mixed product made for reducing epoxy paint, I use Sherwin- Williams Reducer #54. The epoxy sealer greatly strengthens and increases the density of the wood grain at—and microscopically beneath—the surface, fills open grain to a large extent (depending on the porosity of the wood), and darkens the wood color to an even shade. This is especially true for the mahogany I use for interior trim more than any other species. Other dark-colored woods I like are cherry, walnut, and western red cedar. For light-colored woods I install white oak, ash, poplar, cypress, douglas fir, Alaska cedar, northeastern white cedar, and spruce. The epoxy sealer does not darken these woods as much. I minimize my use of teak for the obvious reasons (rainforest depletion and high cost). To obtain a really smooth surface on open-grain woods like some types of mahogany, paste-type grain filler is usually recommended. I almost never use one. They tend to discolor the wood, and involve at least two additional time consuming steps (application and sanding). I rely on my penetrating epoxy to seal and fill the grain, despite the fact that it is not as effective as a paste-type filler. In extreme cases, I may apply two coats of epoxy sealer, waiting overnight for the first to cure thoroughly, which takes more time: two days instead of one. I may also add a few additional coats of varnish to achieve a smoother finish. Sanding penetrating epoxy sealers is a little tricky: If you sand too deeply, as on corners and edges, you will break through the sealer, changing the uniform color of the wood and reducing the functions of the epoxy, to densify and seal the grain. If you sand too lightly, you will have some epoxy that is not properly abraded, and risk poor adhesion; almost nothing will reliably stick to cured, unsanded epoxy, especially if it has “blushed.” I sand with #180 paper, usually by hand unless I am finishing a large surface, like a table, a door, or a finish-grade marine plywood panel, in which case I sand with my Makita 5″ orbital sander before hand-sanding.If your varnish coats are clean and smooth, sanding may be minimal, or nonexistent if subsequent coats are applied the same day. When applying multiple coats the same day, you can surface-dust very lightly with a tack rag on nearly tack-free surfaces. If dust has stuck to the surface, compressed air will not be as effective. I frequently scuff my cured varnish with a fine Scotch-Brite pad the following morning to obtain adhesion for subsequent coats, because it removes less material than sandpaper and conforms better to irregular surfaces. If sharp corners or edges are damaged during sanding, that’s where the finish will eventually fail. For this reason, it’s wise to ease all sharp edges during preparation. There are also many schools of thought on how to apply varnish. Old-timers used high-quality (read expensive), badger-hair brushes, which they cleaned meticulously, using lots of mineral spirits and labor. Some even used a mechanized brush spinner to evacuate material from the bristles. The brush was then massaged straight and stored in wax paper or an equivalent. I deviate from this in the most shameful way possible: I use sponge brushes. But the ones sold in big-box stores are inferior—don’t ever use them. Instead, buy them from a quality source, such as a marine- or automotive-paint supplier. You will see the difference at a glance; the cheap ones will disintegrate in use, leaving little pieces of foam in your work. I often apply penetrating epoxy with sponge brushes because they don’t shed bristles in my work, as do chip or throwaway brushes. Sponge brushes used with epoxy or polyurethane will swell and soften, and can be used only once. Despite the rants against throwaway products, I believe used sponge brushes are less environmentally damaging than gallons of mineral spirits, which are very hard to dispose of safely. For large projects and big surfaces, I frequently spray my varnish with an automotive-industry detail gun. This requires clean conditions, eliminating objects that may be damaged by overspray, and careful mixing and application. Detail guns are typically of the siphon-feed/external-mix type, and require much less air volume than a conventional spray gun of the same type, thus requiring a smaller air compressor. Always clean your spray gun as if you were in an operating theater, and keep condensed water out of your system. For spray-varnishing, I typically suspend my work from hooks and strings tied off overhead, particularly if both sides require varnish. Doors, tabletops, and tillers particularly benefit from this. Varnishing both sides at once saves time. Some things are difficult to varnish any way except by spraying: louvered or caned doors, for example. The downside to spraying varnish is that two or more additional coats are required to achieve proper mil thickness. Note that learning to spray anything with an even gloss or semigloss finish requires time and experience with the coating material and the spray gun. The bottom line is that good brightwork requires strict attention to detail, including the consistent use of proper materials. By following the guidelines in this article, you can produce high-quality professional brightwork in the shortest time possible—and at the lowest cost—without compromising the quality your clients expect to see. About the Author: Reuel Parker is a yacht designer, shipwright, author, and cruising sailor. He divides his time between Maine, South Florida, and the Bahamas. He does business as Parker Marine Enterprises, and is a frequent contributor to Professional BoatBuilder. You can read his blogs at www.woodenboat.com/whiskey-plank.